This creative collective has become part of the pop culture zeitgeist. Blue Man Group has served as the face of branding campaigns for Intel and TIM/Brasil and appeared countless times on hit shows like “The Tonight Show,” “Arrested Development,” “Ellen,” “Schlag den Raab” (Germany), “WOWOW” (Japan), and “Caldeirão do Huck” (Brasil). JEFF QUAY (Full time Drummer/Associate Music Director) After growing up playing drums in Wisconsin, Jeff studied jazz performance at the University of Miami school of Music. Becoming a busy freelance musician, a move to NYC was the logical choice. After a few years spent gigging in countless jazz, rock, blues, cajun, and jam bands, he met the founders of Blue Man Group in 1993 and was soon invited to join. 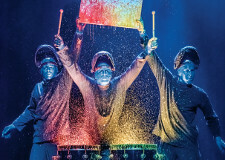 After opening the Boston Blue Man Group Production and performing for two years, Jeff then moved to Chicago in 1997 to open the third Blue Man Group production. Since that time his involvement in the group has grown to include several televised performances on “The Tonight Show with Jay Leno,” “Last Call with Carson Daly,” and the 2001 Grammy Awards. His drumming can be heard on the Grammy nominated recording “Audio” “The Complex”, and the newest BMG recording “Three”. In addition to performing, Jeff’s duties include helping to oversee all the different BMG shows around the world as Associate Music Director. CALLUM GRANT (Blue Man) Scottish. Learned piano, violin, guitar, ukulele, drums and percussion at some point … has since blurred most formal training and is now a self-proclaimed noise hack. Writes, records, sings and plays in the band Whisky Tales (google it, I dare you), as well as numerous solo projects including movie scoring and music/comedic work at Second City and IO Improv theaters. Toured globally as a Blue Man since 2005, highlights include London, Berlin, Tokyo, Sydney, Rio De Janeiro, Amsterdam, New York and now Chicago. Somehow holds a 1st class honors degree in Contemporary Theater Practice from the Royal Scottish Academy of Music and Drama. Still believes pairing socks is a waste of time. TOM GALASSI (Blue Man) is thrilled to re-join the Chicago cast. Over the years Tom has been the Blue Man Captain of the Chicago, Toronto, and Berlin shows and also the How To Be A Mega¬star tour. He toured the U.S. and Canada on the Complex Rock Tour and is featured in Blue Man Group’s first concert DVD, The Complex Rock Tour Live! He has appeared on numerous TV shows including “The Tonight Show,” “The Wayne Brady Show,” “America’s Got Talent,” and “The Royal Variety Show,” where he performed for and met the Queen of England. Tom has also acted as a Blue Man trainer. He started a produc¬tion company called Downstate Productions and his first film, Troubadours, is available on DVD. Love to Mom and Dad, Brother Adam, wonderful wife Kelly, and to all the Troubadours. Tom thought his real name was Boomer until he was five years old. GARETH HINSLEY (Blue Man) is originally from the UK and joined Blue Man Group in 2006. Since starting with the show he has performed in Chicago, London, Berlin, Tokyo and aboard the NCL cruise ship the Norwegian Epic, where he was Captain (of the Blue man show, not the actual ship. Although he did hold the steering wheel once). 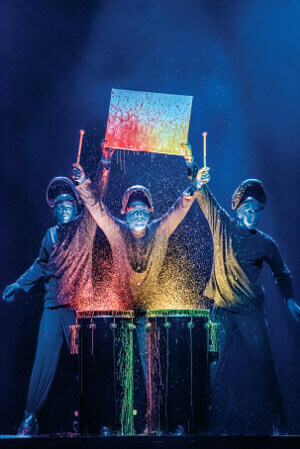 As well as performing in the show, he has worked on many outside performances with Blue Man, including trips to Moscow, Beijing, Munich, Sweden and Chicago’s Millennium Park. Gareth started his career in London where he worked as an actor appearing in both Television and theatre. After auditioning for Blue Man Group and attending drum school in London, he came to Chicago to complete his training.